The Princeton Club invites you to a discussion of the challenges and opportunities in the field of architecture, followed by a curated tour of key exhibits in the Chicago Cultural Center led by Susan Conger-Austin *83 and Jonathan Solomon *03. The Princeton Club of Chicago invites you to a unique event at the inaugural Chicago Architecture Biennial (http://chicagoarchitecturebiennial.org/) led by graduate alums Susan Conger-Austin *83 and Jonathan Solomon *03. The Chicago Architectural Biennial, The State of the Art of Architecture, is the largest international survey of contemporary architecture in North America. The exhibition is a multiplatform event that will display a number of radical ideas, projects and spatial experiments from more than 100 international architects that demonstrate how creativity and innovation can tackle the possibilities of everyday life. Susan and Jonathan will discuss these challenges and opportunities in the field of architecture in this age of ever-increasing change – from education to environmental awareness to economic growth to new forms of housing within local communities and beyond. 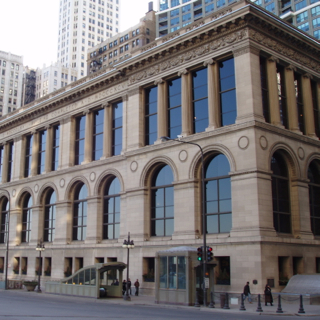 The discussion will be followed by a curated tour of key exhibits in the Chicago Cultural Center. Susan is the head of S. Conger Architects and Studio Professor and Director of Foreign Relations, College of Architecture, IIT. Jonathan is Director of Architecture, Interior Architecture, and Designed Objects at SAIC. We hope you will join us for this very special event. Since the event will be a walking tour through the Cultural Center, kindly coordinated with the leadership of the Center and the Biennial, attendance will be limited to 25. This event will be very popular, so we urge you to RSVP now. Thanks to our gracious hosts, reservations are free of charge, but attendance is limited to the first 25 people to RSVP.